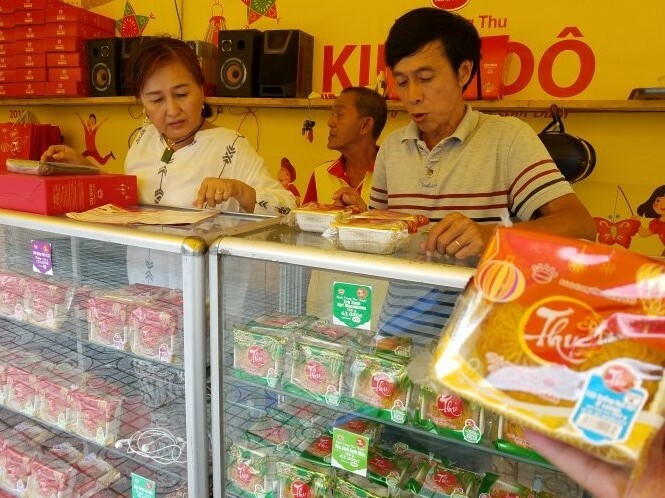 A large number of low-cost imported mooncakes are being sold in the Vietnamese market as the Min-Autumn Festival is approaching, posing concern over their quality and safety. The products, advertised as originating from Taiwan, Hong Kong, and mainland China, are mainly available on online shops at only VND2,000 (US$0.08) to VND7,000 ($0.3) apiece. The cakes have a wide variety of flavors from sweet, such as strawberries, mangos, oranges, and red beans, to savory. Some shops in Hanoi even offer discounts for bulk purchase, with one kilogram of fruit-flavored Chinese mooncakes, about 23 to 24 cakes, costing only VND100,000 ($4.3). At another store, a box of 130 Taiwanese mooncakes sells for VND320,000 ($13.76). Imported mooncakes are advertised on a Facebook page. According to one of the online cake sellers, the products last up to six months. Meanwhile, popular Vietnamese brands have also started selling their products to prepare for this year’s Mid-Autumn Festival, which falls on September 24. Locally-made mooncakes often have a bigger size, with cheaper products costing about VND63,000 ($2.71) for a 150-gram cake. More common types of cakes, weighing about 200 grams, sell for VND100,000 ($4.3) to VND150,000 ($6.45) a piece. Premium brands cost between VND1 million ($43) and VND3.5 million ($150.5) per box of four to six cakes. Some companies also decided to import products from famous brands in Thailand and Malaysia to provide their customers with more options for the festival. A box of Malaysian mooncakes costs about VND600,000 ($25.8) to VND2 million ($86). The festival also brings business opportunities to homemade cake sellers, who offer more affordable products. Such a homemade cake, weighing around 125 grams, costs VND45,000 ($1.94) to VND55,000 ($2.37). Insiders advised that buyers should be more cautious when selecting products that are too cheap and pay close attention to their expiration dates. The Mid-Autumn Festival, celebrated on the 15th day of the eighth month in the lunar calendar, is considered a special occasion for family reunions, with the original shape of the much sought-after mooncakes indicative of the celebration’s meaning. During the festival, family members get together, make offerings to their ancestors and enjoy mooncakes over fragrant tea while admiring the full moon.